Choosing what college to attend (or whether to attend at all) can be a difficult and stressful decision for teens. But we as teachers and parents have an incredible opportunity to help guide them in their decision-making process. A wise word spoken at the right time can help provide clarity, encouragement, and perspective. As we have opportunities to discuss college options with Christian teens, we should certainly encourage them to consider attending a Christian college. While this path isn’t for everyone, I believe every teen should, at the very least, give it serious consideration and prayer. My time at college (I attended Pensacola Christian College) impacted me significantly, and I would not be who I am today without the lessons and truths I learned there – from practical instruction to spiritual truths to meaningful friendships. While the most important guiding factor in this decision must absolutely be the leading of the Spirit, teens should be encouraged to start by praying about Christian colleges and only seriously considering secular colleges after God has given them clear direction in this area. Why? Well, I’m glad you asked. Secular courses have a strong progressive, humanistic agenda. As I discussed in my post Is Christian Education Really Important?, if the only problem with secular courses was evolution and atheism, we would all be in great shape. These are relatively easy to refute because the agenda is clear and obvious. But the progressive agenda goes far beyond such blatant falsehoods. It creeps into every area of academia, infiltrating even the seemingly innocent areas of art, history, music, business, medicine, and educational theory. Nothing is neutral – each area can be viewed through a secular, humanistic lens or a Biblical one. And I’ll give you a hint – secular colleges aren’t using the Biblical one. Christian courses should be taught from a strong Biblical worldview. In contrast, courses at Christian colleges should provide instruction from a Biblical perspective. (I say should because not every college that calls itself Christian is true to its name, but that’s another story.) I was amazed as a young college student to learn that there was a Biblical view to subjects I had previously considered neutral. I wouldn’t have gained this insight if I had attended a secular college. I would most likely have slowly started to believe the subtle lies. What a difference – to not only avoid the lies but to instead become strong in the truth. Christian colleges provide spiritual instruction. Most Christian colleges include Bible classes, chapel services, prayer groups, and other spiritual instruction as a part of the experience. The opportunity to learn more about Scripture and its application to your life is incredible. When I was in college, I not only experienced tremendous growth in my Christian life through this instruction, but I also was encouraged and uplifted during challenging days. Friendship with fellow believers is invaluable. One of the biggest differences between a secular and a Christian college is the opportunity for meaningful friendships. Yes, you can find good Christian friends at a secular college, but there’s something amazing about the synergy of a Christian student body. Young adults are often not as spiritually mature as they think they are. I know we all like to think that we have it all together, but there’s always a lot more to learn. And especially at age 18, it’s easy to think that our faith is stronger than it is. When I headed off to college, I considered myself a strong Christian. But as I look back I see that I really wasn’t. I had so much more to learn (and still do). If I would’ve gone to a secular college, I’m sure I wouldn’t have become an atheist, but I wouldn’t have been able to discern as much as of the error as I thought I would’ve. My spiritual life would have suffered, and I would’ve missed the opportunity for serious growth. But what about our call as Christians to be a light to the world? I wrote more about this in my post Is Christian Education Really Important?, but the main issue is that undergrad college students are still in training. Most young adults are still learning to distinguish truth from error and could be derailed by training in the camp of the enemy. Once we’ve developed a solid foundation of Scriptural truth, we are able to go into the world and combat the its philosophies, but as we discussed, most young adults are not yet as spiritually mature as they like to think they are. 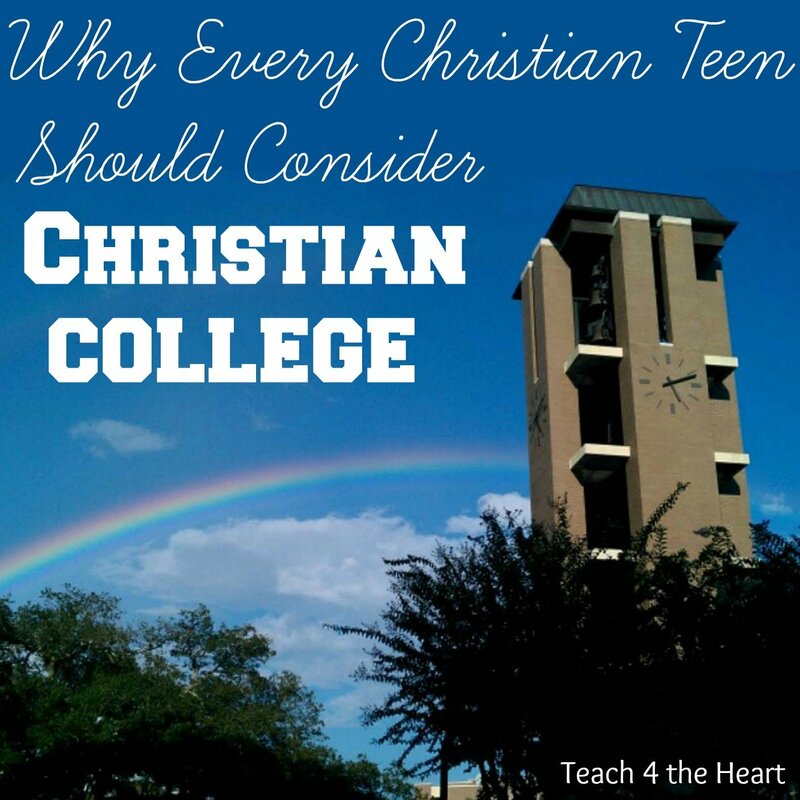 Do you agree that all Christian teens should seriously consider attending a Christian college? Why or why not? Share your thoughts with a comment below. You have written good points in this article. I agree with you. Christian Education uses method and content that develop thinking and articulate. I just discovered your wedsite yesterday. I am so excited about it and have already shared it with my oldest daughter and two nieces who are also teachers. I am looking forward to reading more of your articles. I, too, am a strong supporter of Christian colleges. Some of the wisest words of support for Christian colleges I ever heard came from my mother-in-law. She said when their children came home each day from public school, they had Dad and Mom to help them through problems and tough situations. When a child goes off to college, that support system is not as close. A Christian college provides more access and opportunities for that spiritual support. My husband and I are both graduates of Christian colleges and blessed to have had all four of our children choose to attend a Christian university! I accepted Christ as my Savior when I was 15; and I’m not from a Christian home. My going to a good, solid Christian college (PCC) helped me to grow as a Christian and to learn Biblical doctrine. I am very thankful for the friends and excellent teaching I received there. Now my son is a student at PCC. He wouldn’t consider any other choices I’m thankful to say. Currently I have a friend who’s son went to a Christian college because his parents gave that as an only choice. He went one year. He left the Christian college because of the influence of his “Christian” girlfriend and he went to the local community college and is now in a state university. I’m sorry to say that he has denounced his Christian beliefs and has embraced atheism- and that is because of the persuasive teaching of his professors. Christian colleges can make a difference. And please pray for my friend’s son. Ok, so I’m a senior about to graduate high school, and am super interested in becoming a teacher. I’ve been reading your blog for a little while now, and has really encouraged me! My sister went to PCC, and I was looking into attending there as well, but come to find out that if I majored in elementary Ed, I wouldn’t be able to get credentials in CA because of the accrediting (TRACS) that they use. I was just wondering how you were able to, and if you had any ideas for me? Hi Mary. PCC recently got accredited but I’m not sure exactly how the credentials work for each state. I didn’t have any problems in Ohio – but I also taught at a Christian school so the license I needed wasn’t as strict. I will say this about PCC – they have an excellent education program. I learned so much from them and I’ve honestly never come across an education program that prepares you better than them. Feel free to send me an email if you’d like to talk more or have questions. I stumbled onto your blog and saw this post. It was nice to see your perspective since I honestly did not understand the phenomenon of Christian colleges. 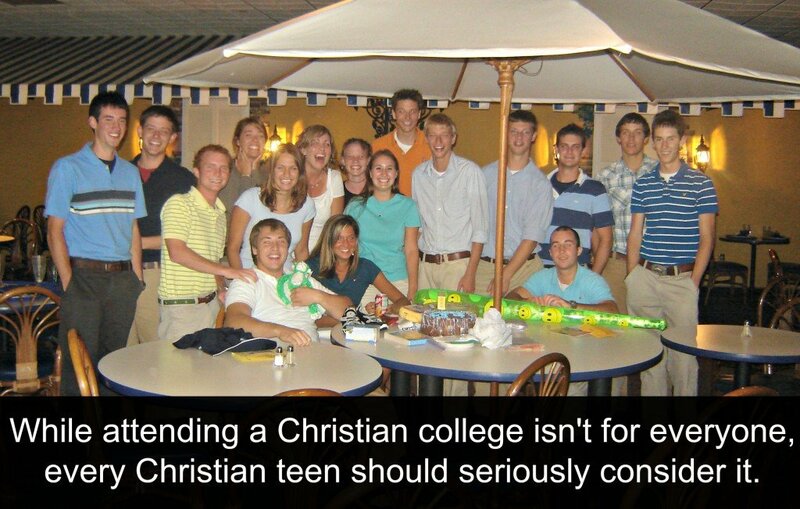 I became a Christian in college while attending a secular college. Though I appreciate your perspective, I would love to share with you why we need more solid Christians to choose secular colleges. 1. Refining Fire: Like you mention so much of secular college goes completely against a Christian worldview. You must be able to articulate what you believe and why. This baptism by fire makes us so much stronger in our faith. We constantly have to ask why we believe what we believe and apply it in a challenging environment. There is no better way to prepare for life in a secular world. 2. Welcome to the mission field: Your classmates and friends will be non-Christians. They might have never met a Christian who lives out their faith. When I came into college as an atheist, seeing the difference in how Christian around me were living was what first sparked an interest in Christianity that God fanned into a fire for Him. For some of my friends who came from Christian families, they felt like they were choosing the “lesser” option by choosing a secular school. I would discourage you from this view. Although I definitely feel that God can build his followers through Christian schools at all ages, they should not be used as a way to hide from the world that so needs the love and hope of God.